A few years back I spoke with Bobby Conway (the One Minute Apologist) and answered the question, “Did the disciples lie about the resurrection of Jesus?“As a skeptic, I believed that the story of the Resurrection was either a late distortion (a legend) created by Christians well after the fact, or a conspiratorial lie on the part of the original Apostles. It wasn’t until I started working homicides (and homicidal conspiracies in particular) that I decided an Apostolic conspiracy was unreasonable. I’ve written a chapter in Cold Case Christianity describing the five necessary elements of successful conspiracies, and none of these elements were present for the Apostles. But even more importantly, the Apostles lacked the proper motivation to lie about the Resurrection. My case work as a homicide detective taught me something important: there are only three motives behind any murder (or any crime, or sin, for that matter). All crimes are motivated by financial greed, sexual lust (relational desire) or the pursuit of power. If the Apostles committed the crime of fraud on an unsuspecting world, they were motivated by one of these three intentions. Most people will agree that none of the Apostles gained anything financially or sexually from their testimony, but some skeptics have argued the Apostles may have been motivated by the pursuit of power. Didn’t these men become leaders in the Church on the basis of their claims? Couldn’t this pursuit of leadership status have motivated them to lie? Wasn’t it a goal of early martyrs to die for their faith anyway? 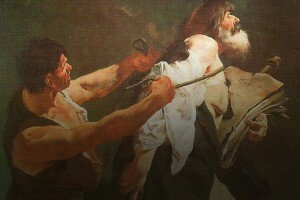 As I examine the motives and consequences related to the testimony of the Apostles, I still find their martyrdom to be one of the most powerful evidences related to the veracity of their testimony. Think about it for a minute: twelve designated eyewitnesses traveled the known world to testify to the Resurrection. Not a single one of them recanted their testimony. Not a single one of them lived longer because of their testimony. Not a single one benefited financially or relationally. These folks were either crazy or committed, certifiably nuts or certain about their observations. As Easter approaches, it’s time to take the testimony of the Apostles seriously. Next Why Make the Case for Christianity, If God Is in Control?